The parable of the lost sheep (Matthew 18:12-14) is about those who are already in the family of God but have wandered away. It is an illustration of God's love and care for his people. Throughout the week, we read the story from several different story books. Here we are playing a game called "Find the Lost Sheep". It's a game of observation and visual tracking. 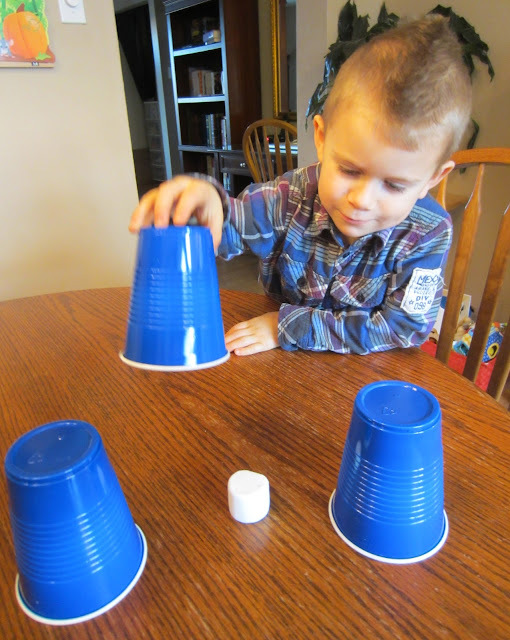 The boys liked playing the shepherd––keeping a close eye on the sheep as I moved the cups around. After awhile, the boys played together on their own, and even eating a "sheep" every now and then!